What is a volumetric Mixer. Volumetric mixers produce and mix the readymix on site as opposed to a drum mixer where the readymix is mixed at a concrete plant and then loaded into a drum mixer for transport. As readymix is freshly produced on site you have maximum workability, and the exact amount you require 'No Over or Under Ordering' so jobs with uneven shapes or uneven depth will never be a problem again. How quickly can you deliver and when do you deliver. We generally need 24-48 hours notice for delivery, but this can vary at different times of the year, however, we will always do our best to fit you in. We deliver Monday to Friday and Saturday until midday with prearranged delivery times. How wide are the vehicles. 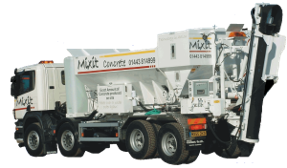 All our mixers are 2.5 metres wide, but whilst they may fit onto a drive, it has to be at your responsibility as we never know how strong a drive is. What concrete do I need. We can advise you on the correct mix to use, we supply mixes suitable for driveways, slabs, paths, footings, internal floors, stables and farm buildings etc. Wheelbarrows and discharging into them. All mixers carry one wheelbarrow for our customers use, we would however recommend that you also have additional barrows available, especially if you have ordered more than one metre. One cubic metre of concrete weight 2.4 tons which equates to 25-30 wheelbarrows. Wear protective clothing ie goggles, impervious boots, trousers and long sleeved clothing when working with readymixed concrete.